A coworker recently introduced me to Project Euler, a website featuring mathematical problems intended to be solved with computer programs. The beginning problems are a warm-up and most can be solved by brute-force algorithms. The problems become more complicated as one progresses, requiring a more focused approach. While many of the initial problems involve finding numbers that satisfy specific mathematical properties (prime numbers, Fibonacci numbers, perfect squares, etc. ), later problems can utilize probability, game theory, and Operations Research. The problem that prompted me to check out the site is to maximize the path through a triangle comprised of numbers, starting at the top and moving down the rows of the triangle through adjacent numbers. The site gives a triangle with a base of four numbers as an example (below). The first problem triangle (Problem 18) has a base of only fifteen numbers and can quickly be solved by brute force if desired. However, a later problem returns to this challenge with a triangle with a base of one hundred numbers (Problem 67) – far too large to just iterate through all possible solutions. In constraint (2), if xij equals 1, the variables for all numbers in the next row that are not adjacent to xij must all be 0. Otherwise at most one of these variables can be 1 (although they can also all be 0). A few months ago I wrote a post about my interest in Ant Colony Optimization (ACO) and my goal to add it to my metaheuristic bag of tricks. I finally was able to code up a version of an ACO algorithm and start testing it for the Traveling Salesman Problem (TSP). ACO was initially developed to find the optimal path through a graph so solving TSPs is a natural first test. I have been testing using symmetric TSP problem instances from TSPLIB (mostly problems pcb442.tsp and st70.tsp) and comparing not only against the optimal solution (all symmetric TSP problem instances on TSPLIB now have a known optimal solution!) but also against the results of a Random Keys genetic algorithm. So far I have been impressed by the ACO’s performance, particularly compared with the GA.
For the TSPLIB problem st70.tsp I ran the GA and ACO algorithms 20 times each and calculated the overall best solution found by each algorithm as well as the average and max solutions found. The optimal solution for this problem is 675 so the GA and ACO find good values but neither of them found the optimal value. Of course, each ran for only 45 seconds on average. I assume that it took longer than 45 seconds to find the optimal value to this 70-city TSP problem. The GA found the best solution overall and had a better average solution, but the ACO was more consistent with less variation between solutions and a better “worst” solution than the GA. For problems where the algorithm cannot run several times before outputting a solution, the ACO may be a better choice. Also the ACO is a brand-new algorithm for me and there is plenty of room for growth in its implementation. The GA used in this comparison includes a new operator I wrote specifically for TSP problems, which significantly improved its performance over a standard Random Keys GA, and similar improvements can be made to my basic ACO for solving TSPs as well as other types of problems. A quick note about parameters: GAs are very sensitive to the values chosen for their parameters, like the percentage of the population that is generated through reproduction vs. crossover vs. immigration/mutation. During initial testing I found that ACOs can also be very sensitive to the values chosen for their constants. I noticed when tweaking just a single constant (the constant that controls the contribution that the distance between cities makes towards choosing a next point) that the best solution found was heavily dependent upon the value of this constant. For the TSPLIB problem pcb442.tsp (optimal value = 50,778) setting the constant to 2 resulted in a best solution with an objective of 206,887. Setting the constant to 4 resulted in a best solution with an objective of 79,312! That’s a big difference for changing just a single constant. Like other metaheuristics, GAs included, performance tuning is required when tackling a new problem with an ACO. Sometimes when formulating a LP or MIP, you run into the scenario where it is better to have several small occurrences of a bad event (or good event) rather than a single, larger occurrence. Consider a basic machine scheduling problem of scheduling n tasks on a machine. Each task i = 1 .. n has a different due date di, completion date ti, and number of days late li. It is possible that the users will consider a solution with ten tasks each one day late to be equivalent to a solution with one task ten days late. But they may prefer the first solution because it is a more balanced approach, spreading the lateness evenly among several tasks rather than heavily targeting one unlucky task. then the two solutions above would have the same cost because they are each 10 “task days” short (since the cost of the first solution is c * (1 day * 10 tasks) = 10 * c and the cost of the second solution is c * 10 days * 1 task = 10 * c). 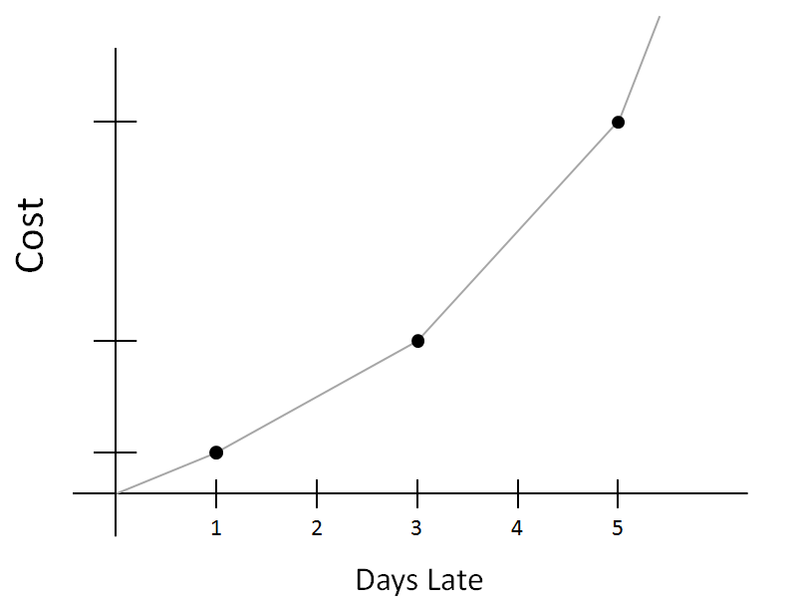 Instead, we could model the objective using a piecewise linear function where the cost increases significantly as the number of days late increases. The CPLEX API has Piecewise Linear functionality (at least in versions 12.3 and 12.4) which I have tried and found works fine in general. It’s also fairly easy to write your own functionality using integer variables to indicate which category of lateness (0-1 day, 2-3 days, 4-5 days, 5+ days) each task falls into and multiplying these variables by the appropriate costs. 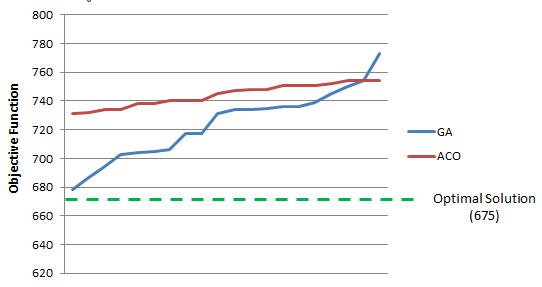 I initially tried the CPLEX functionality for a large production model I was developing but I ran into edge cases that were behaving oddly so I did write my own constraints and did not see a performance difference, even with the largest datasets I used for testing. Warning: As promised, Abstract Algebra joke ahead. What is purple and commutes? Thanks to my undergraduate Abstract Algebra teacher Dr. Todd Ashby for this joke. It is the only reason I still remember what abelian means. As an Optimization Consultant, I spend most of my days working with clients and trying to build models and systems to meet their needs. In general, these are operational systems that run on command and the user sees the results without any human intervention. So they have to be robust to data and user input, which makes this much more difficult than one-off studies where you or I get to massage data and give the user what we want them to see. An interesting side effect of this is that the models we build are only a portion of the overall system and can have minimal impact on the user experience. Partly this is because we spend a significant amount of time before the models ever go live with users making sure the results of the models make sense and are usable when the model team can still manually manipulate the data and output. But a significant portion of it is because when you are looking at an entire system you can’t focus on finding an error in a single piece of output. Therefore, most of the user experience is dictated by the UI. On many optimization projects the UI is an afterthought and I think this is a grave miscalculation which threatens to undermine the entire project. The UI is the only interface a user has to see the model results, so it doesn’t matter if the model creates great suggestions and useful data if that doesn’t translate in a way that the user can see and utilize. I’ve seen good models derailed by a lacking UI as well as the effect a good UI can have on the usefulness of a model. We like to think as OR experts that our models are all that really matter to the client, but in reality clients don’t care how fancy or simple our models are as long as the results they see make sense to them and are actionable. This is especially true as production models become more complex and the input data becomes larger and larger. Anybody else out there have similar results they’d like to share? In linear and mixed integer programming, constraints often have a bad reputation. If a model is a family, then the constraints are the parents – making sure everyone does their homework, brushes their teeth, and in general obeys the rules. Parents can be a pain though, making us eat fruit when we want to eat candy and go to bed early when we want to stay up all night. And all of this parental guidance can hurt performance. A modeler who has developed a large-scale MIP with many different types of constraints probably knows the anxiety that can accompany the addition of each constraint. Will this next constraint be the one that kills the model’s run time; the straw that breaks the model’s back? Even seemingly innocuous constraints can cause problems when added to an already complicated MIP. This can lead to a fear of adding a new constraint to a functioning model. But just like good parents nurture their children and help them become more than they could be by themselves, constraints not only improve a model by adding realism to the model, they can even improve performance under certain circumstances. Let me give you an example that I ran into just last week while working on a large-scale MIP that already has 10-12 different types of constraints. One of these constraint types attempts to bring balance to the model by distributing a resource to a group of parties based on each party’s stake in the overall system. For instance, consider a long-term assignment problem where workers are assigned to shifts, including a limited number of prime shifts. To make sure the prime shifts are fairly distributed, workers with longer tenure in the company should receive more prime shifts. Let pi be the number of prime shifts that worker i has the right to based on his/her tenure and let sij equal 1 if prime shift j is assigned to worker i. Then let xi be the cost (i.e. penalty) for not assigning enough prime shifts to worker i. The constraint to set xi is then xi≥pi-∑jsij. If at least the “fair” amount of prime shifts have been assigned to worker i, then the penalty variable xi has to be greater than or equal to 0. Otherwise, if worker i does not have enough prime shifts, the penalty variable xi has to be greater than or equal to the gap between the fair number of prime shifts and the actual number of prime shifts. Adding xi to the objective of minimizing the total cost of the schedule will guide the model towards a more fair schedule in terms of prime shift allocation since a more fair schedule will decrease the values of xi‘s and thus the total cost of the model. You will notice that in the constraint above, we’ve only set the minimum value of xi. Since there is a cost associated with the value of this variable, the solver (in our case Cplex) should always choose the smallest value possible for the variable, thus providing the upper bound on the variable. But when we started to test the model after adding this constraint we realized that while it was obvious to us that the value of xi should always be either zero or exactly equal to pi-∑jsij, it was not so obvious to Cplex. The penalty variables were often set higher than “necessary” until the optimality gap got fairly small towards the end of the model solve. Now this in theory is not an issue since the optimal solution will always have the penalty variables set as low as they can be set. However, our model is large and has a 30 minute run time limit, so there may be times when the model run ends with a large optimality gap and thus those variables are set higher than necessary. Also, this adds to the complexity of the model and is one more thing Cplex has to try to optimize when, in fact, we know the exact value that each of these variables should be. So we decided to try adding another constraint to provide the upper bound for these penalty variables (either zero or pi-∑jsij depending on whether or not worker i has his/her fair number of shifts). The two constraints combine as xi≥pi-∑jsij and xi≤pi-∑jsij when pi≥∑jsij; effectively xi=pi-∑jsij. Once we added this new constraint, Cplex is no longer able to set the value of the xi‘s higher than “necessary”, reducing the search space. The solve starts with a lower optimality gap right away and the model solves faster. In many cases, adding new constraints can negatively affect performance, but when the current set of constraints allow the solver more latitude than necessary, as in our case, adding a constraint or two to provide more guidance to the solver can improve performance and reduce run time. Sometimes having strict parents can be a good thing.